I am pleased to be able to bring you another interview with a member of the Marella Explorer entertainment team. 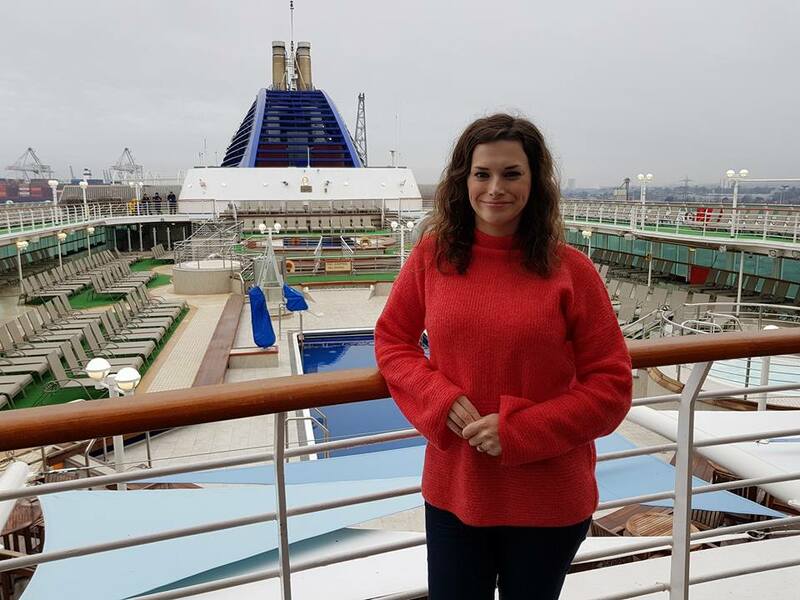 Kathryn Anderson is a Singer/Dancer in the ship’s show cast, and she told me all about her onboard role working for Marella Cruises. If you missed my last officer interview with Marella Explorer’s Cruise Director Matthew Shaw, you can read it here. This is your first professional contract, how are you finding it so far? This is my first contract working for TED (The Entertainment Department) for Marella Cruises and I am absolutely loving it! It is a challenge being away from home for so long but it makes it easier being able to do what I love every night, within spectacular production shows. I have always had the travel bug and my passion is performing, so being able to mix the two together makes it the perfect job for me. I’ve always loved performing since I was a young child. I went to train professionally at the Liverpool Theatre School and have been working in the industry since I graduated in 2014. I’ve always worked as a singer/dancer so I would say that is my specialism and it is what I enjoy the most. How did you feel the first time you performed on stage in the onboard theatre, in front of passengers? It was a massive buzz! The audience were amazing. The reaction we received was quite overwhelming and it felt so good to finally perform the shows in such an amazing theatre. Can you tell me a bit about the process involved in becoming a cast member at sea? I auditioned at the beautiful Jacksons Lane Arts Centre in London on 5th January 2018 and received a phone call a few days later offering me the position. We then had to complete our STCW sea safety training course in Liverpool where the majority of the cast met. 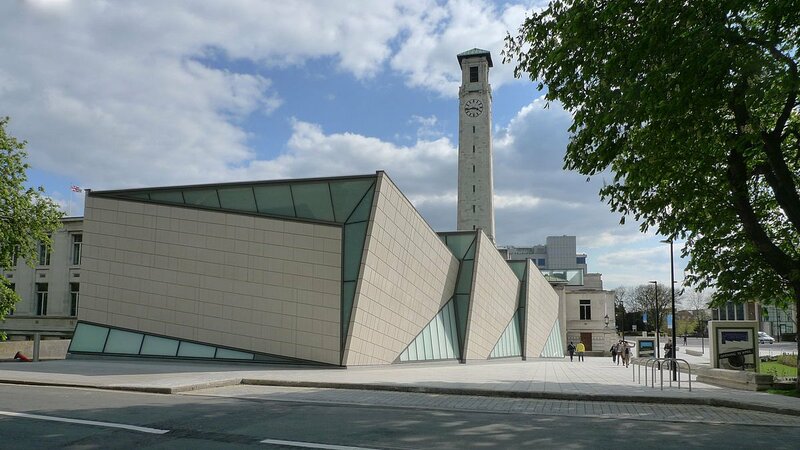 A few days later we began our intense three month rehearsal process in Milton Keynes. How many are in your cast, where do you originate from and how long are your contracts? There are 12 members in our cast – 6 boys and 6 girls. I am from Liverpool and our contract at sea is 9 months. 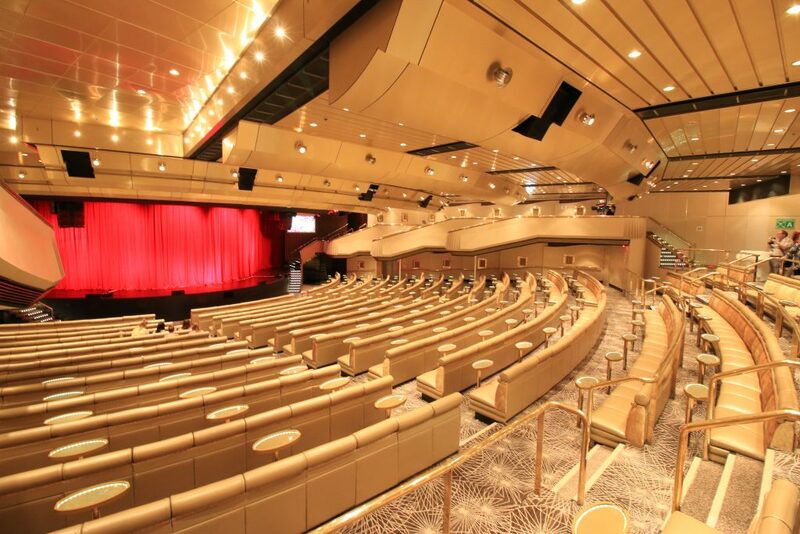 How many shows do you perform on a typical two-week cruise and do you do any other duties on board? On a typical two-week cruise we perform six shows a week – twice a night. Singers and singer/dancers also perform solo cabarets in different venues around the ship. During the summer period we also performed in an additional two children’s shows. We went through a very intense rehearsal period at the beginning of the contract, which means we don’t have too many rehearsals at all now, other than the daily technical run-throughs. What type of shows do you perform and do you have a favourite? We have a wide variety of shows that range from musicals to rock and many more genres. 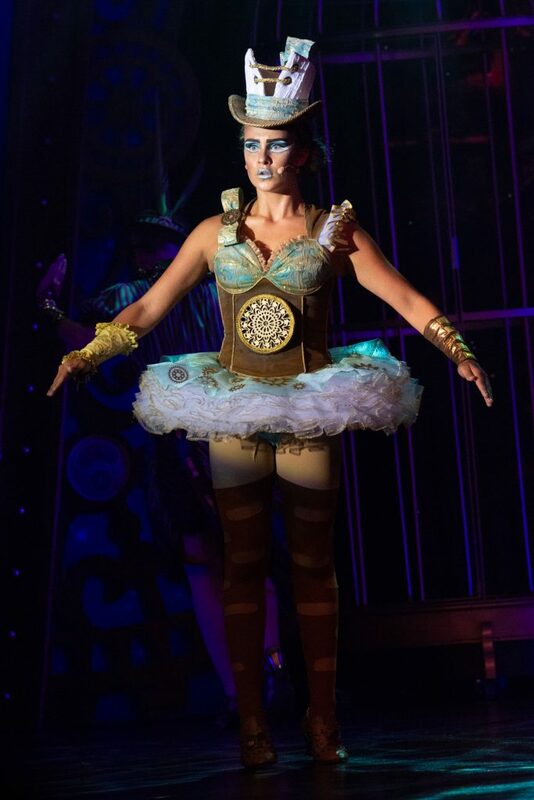 My personal favourite is ‘Cogs,’ which is our steam-punk inspired production. This is my favourite by far, as it’s completely different to any other show I’ve been involved in. The costumes are incredible and I love the character I play. What do you find is the hardest thing about working on a cruise ship and what is the best? The hardest part is definitely being away from family and loved ones for so long, but they are all really supportive which makes it a lot easier. The best part is waking up in a different country every day and exploring, then coming back to be in shows which I love performing. How do you cope as a performer in rough weather? Do shows get cancelled? We have been lucky so far this year, but if the weather was particularly rough we would have to cancel the show or make some changes to ensure we were all safe on stage. Have you faced many challenges since you started your contract? Having to retain 12 shows was quite challenging, but luckily enough we have a very talented cast who helped each other through the process of learning the shows. What do you like most about Marella Explorer and Marella Cruises? I love the itinerary on board the Marella Explorer; I feel really lucky to be able to travel the Mediterranean and the Caribbean. I like the fact that the Marella fleet is smaller than some companies. It means you get to know the majority of the crew and we also get the chance to really bond with some of the guests. Have you got any advice for anyone considering a career as a cast member on a cruise ship? How would they go about applying for a role on board? Enrol on the Stage website – they post a lot of auditions on there. It’s also really easy to find auditions online now too. It’s a very tough industry with a lot of people trying out for the same job. There are a lot of highs as well as some lows, but if you stick with it and work hard it is extremely rewarding! Marella Cruises, formerly Thomson Cruises, is a British cruise line operated by TUI UK. 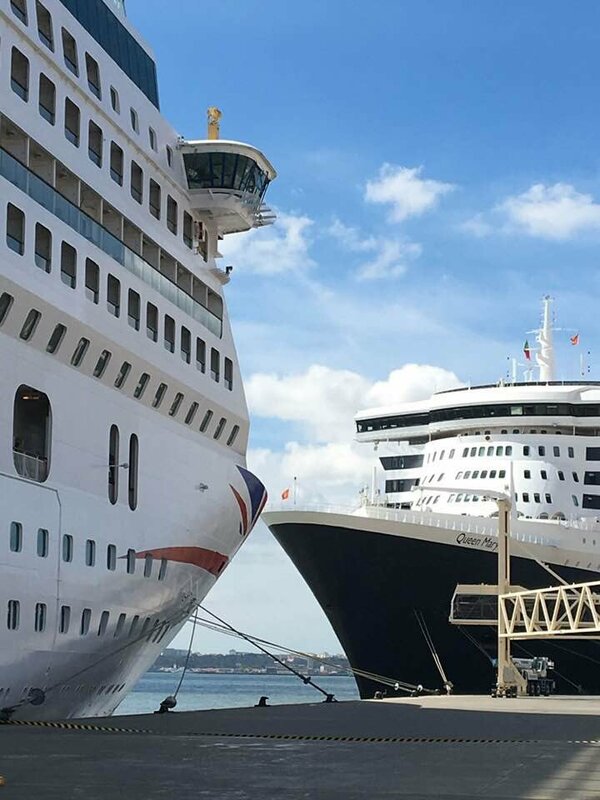 The British company are the third largest cruise line in the UK with six ships in the fleet: Marella Dream, Marella Celebration, Marella Discovery, Marella Discovery 2, Marella Spirit and the recently launched Marella Explorer. The fleet has a varied itinerary, which takes in stops in Norway, Asia, North America, the Caribbean and the Middle East. The cruise line is well known for its excellent onboard entertainment and British style of cruising, which get outstanding reviews from passengers. It offers very good cruise packages – all tips and gratuities are inclusive of your fare. TEDGroup hold the entertainment contract for the Explorer class of the Marella Cruises fleet. 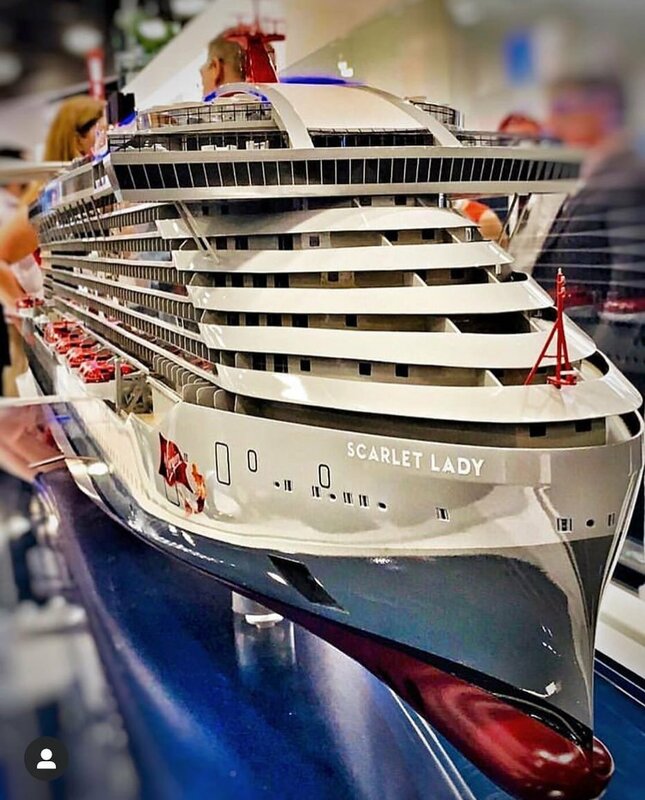 They have designed, produced and implemented a brand new, original and creative West End standard entertainment product and deploy staff to these class of ships.